Science, Technology, Engineering, and Mathematics, otherwise known as STEM, has become a major focal point in today’s education in schools. However, individuals are now proposing that Art be added to the mix, which would be STEM + Art = STEAM. The goal of this would be to take science, math, and technology and add the fine elements of human imagination and creativity to it. This has led to quite some controversy and debate. As a parent, it is a tad bit confusing to choose the best option so you must go with the flow of your child’s personality and expose them to various parts of the STEAM approach,. .
Camp Invention is one such experience that blends both, STEM or STEAM. Your kids get a chance to cooperate and collaborate with their team (peers) to look for answers for real world topics and, while thinking through logical steps. The program associates them to the creators, who have contributed in making the world a better place and have in depth knowledge of scientific topics. The target is to emphatically affect their state of mind and approach towards science, while strengthening their capacities to make powerful advancements to construct a superior future. To begin off, the class provides considerable exposure to robotics and programming. The vast majority of you realize that as a field it is a wide domain, for the most part includes the hardware the equipment, and the software. There are several competitions for a range of age group that can channel competitive instincts in kids through a positive way. Optibot™: Campers will lead themselves into the future with their own Optibot — a little self-driving robot that detects changes in light. Robotic Pet Vet™: Throughout this module, campers nurture their mechanical puppy back to wellbeing and design and construct dog parks as they pound out thoughts for the best park attraction. Mod My Mini Mansion™: Campers will think up, plan and manufacture their own one of a kind cutting edge tech home loaded with automated stuff, LEDs, innovation and developments! 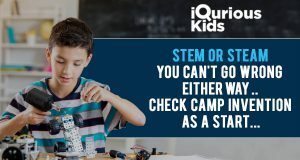 Stick To It™: Campers will develop something new consistently as they investigate what it resembles to be a physicist, architect and business visionary. Young trailblazers will develop, make and quote answers for true difficulties by building their own particular models and finding that the sky’s the limit. Every year the competition at Camp Invention has lot of kids participating. There is no better option to get your kids’ interest levels up in terms of STEM, when it comes to Camp Invention. If you feel like enrolling them ASAP in Camp Invention, then get in touch with us.